The Cultural Resources Division, in coordination with non-profits like Lost Towns Project,Inc. and Anne Arundel County Trust for Preservation, Inc. offer citizens the opportunity to rediscover Anne Arundel County’s history first hand. Whether you are a retiree or a college student, or even if you are just curious and just want to see how archaeology happens, we have an activity that will suit your interests. We encourage the general public to dig alongside the County’s professional archaeologist, volunteer in our lab, or research the County’s past at the Maryland State Archives. No prior experience is necessary, just an enthusiasm for the past. Anne Arundel offers many exciting volunteer opportunities and events for the public! _ Hands-On Material Culture Workshops during special 2019 evening lab hours (see laboratory work tab below)! 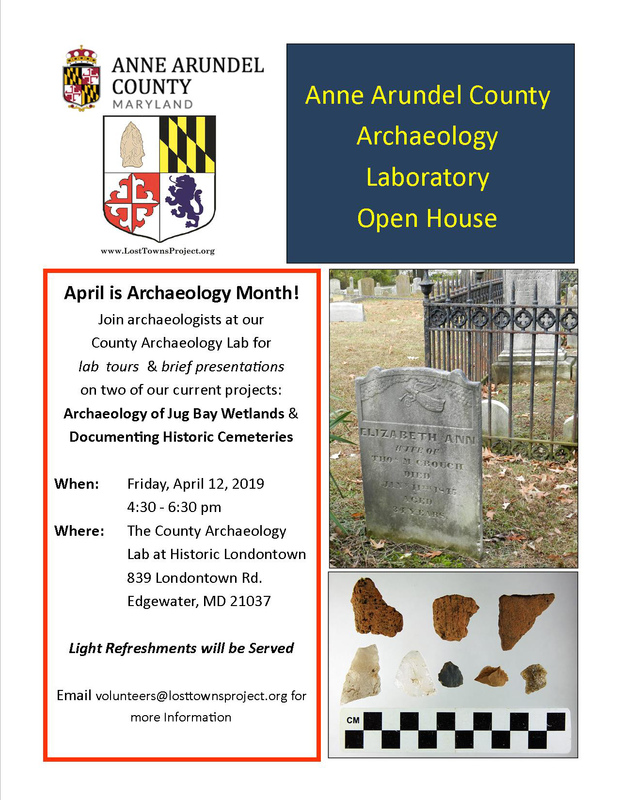 _ April 2019, Maryland Archaeology Month! _June 8, 9am-Noon: Anne Arundel County Cemetery Symposium - "Resurrecting Histories: Cemeteries of the Four Rivers Heritage Area"
Keep checking back here for updated listings of future events! Find out about our volunteer opportunities below. Volunteers and Interns can participate in a real archaeology dig on Native American sites or colonial plantations. The County has nearly 1,400 archaeological sites, so locations may vary depending upon the current research program and the seasons. As a volunteer, you can experience “on the job” training at real archaeology sites, and tasks may include digging, screening for artifacts, and documenting the excavations. The County offers regular volunteer field opportunities to citizens who wish to gain experience in archaeological fieldwork. We also offer field opportunities to document historic buildings and cemeteries. Email pzsing23@aacounty.org to learn more about how you can participate. Anne Arundel County's Archaeology Lab facility, located at Historic London Town and Gardens in Edgewater, Maryland accepts volunteers and interns to help process artifacts, including washing, labeling, analyzing, conserving, and cataloging artifacts. Ever want to be an archaeologist? Well come on down and give it a try. Anne Arundel County's archaeology lab will offers many volunteer and student research opportunities. RSVP is required prior to participation in order to ensure daily space and availability. Email Dr. Zac Singer, pzsing23@aacounty.org, to arrange your first visit or to reserve your volunteer spot in the lab! No Experience Needed. Children under 16 must be accompanied by an adult. Volunteers are also needed to assist with archival research at the Maryland State Archives. Before beginning excavations at an archaeology site, one must research land records, census data, wills and probate inventories and historic maps, all of which helps formulate research questions and better understand the historic context of these resources. No prior experience is necessary; we will assist you in getting started. The Anne Arundel County's Archaeology lab facility is also the receptacle for hundreds of books on the history and archaeology of the County recently acquired by the Anne Arundel County Library System. The library is open to the public for onsite research by appointment only and the books cannot be checked out. Call (410) 222-1318 or email pzsing23@aacounty.org for more information. Anne Arundel County's professional archaeologists, architectural historians and historians welcome advanced high school and college interns to join us. Under the teams’ professional guidance, students can learn the ropes and find out if a career in archaeology is right for them. Often, credit can be arranged in cooperation with your academic institution. Call (410) 222-1318 or email pzsing23@aacounty.org for more information.